For the second time in 2018, Russia has announced the beginning of sea trials of its ‘Poseidon’ underwater drone. Russia has reportedly kicked off sea trials of its latest doomsday weapon system, a nuclear-capable underwater vehicle (UUV), codenamed “Poseidon,” reportedly designed to deliver a 2-megaton nuclear warhead to destroy enemy naval bases, carrier strike groups, and entire coastal cities by triggering a radioactive Tsunami wave. “In the sea area protected from a potential enemy’s reconnaissance means, the underwater trials of the nuclear propulsion unit of the Poseidon drone are underway,” a Russian defense industry source told TASS news agency on December 25. According to the source, the UUV has been fitted with a reactor in its hull. The source also revealed that the current tests are part of experimental design work rather than full-fledged sea trials. As I reportedly previously, Russia’s Ministry of Defense (MoD) already announced in July that sea trials, primarily focused on the UUVs guidance system and underwater operations in autonomous mode, were under way. The source also said on December 25 that the Russian Navy supplied one of its nuclear-powered submarines as the UUVs’ carrier during sea trials. This submarine very likely is a B-90 Sarov-class Project 20120 diesel-electric submarine — the only sub of its class currently in service in Russia specifically designed to serve as a testing platform for new naval weapons. With a diameter of 1 meter, the “robotic mini-submarine” (or torpedo) would apparently be launched by either a Project 09852 sub – based on the 949A Oscar-class boat—or a Project 09851 submarine, laid down in December 2012 and July 2014 respectively and with unknown completion dates. Once completed, both submarines will have the capability to carry smaller [UUVs]: The Project 09852 sub will be able to carry up to six torpedoes, whereas a Project 09851 boat will be capable of fitting up to four UUVs. Based on information on the slide, the new weapon could be equipped with a thermonuclear warhead with a layer of cobalt-59, “which on detonation would be transmuted into highly radioactive cobalt-60 with a half-life longer than five years,” the BBC reports. A prototype is slated to be built by 2019 with first tests occurring sometime around 2019-2020, according to the paper. The UUV is being designed a weapon of last resort to strengthen Russia’s nuclear deterrence posture vis-à-vis the United States and NATO. Torpedoes equipped with a nuclear propulsion system and fitted with a nuclear warhead for use over long distances were first conceived in the Soviet Union back in the 1950s but were considered impractical and unreliable at the time. 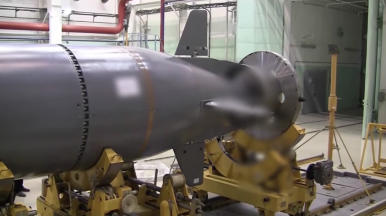 There are still questions whether Russia will be capable of building a reliable miniaturized nuclear reactor for the UUV. The drone is listed in Russia’s state armament program for 2018-2027 and is expected to be delivered to the Russian military in the late 2020s. However, the “Poseidon” UUV will likely not move beyond the prototype stage as it is appears to have been designed primarily for negotiation purposes for future strategic arms reduction talks with the United States and NATO. Russia’s first submarine capable of launching the Poseidon nuclear-tipped torpedo will reportedly be operational next year.